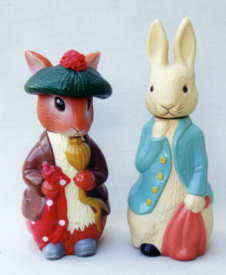 One of the earliest Peter Rabbit soft toys was manufactured by Steiff in 1905. Dressed in the familiar blue jacket, with little soft slippers on his feet, in 2006 one of these rabbits sold at auction for £2,350. He was in almost perfect condition, just missing one slipper. Much more affordable are the ranges of plush toys made by companies such as Eden and Golden Bear. Featuring the main Beatrix Potter characters, these animals are delightful, and are excellent representations of the much-loved characters. 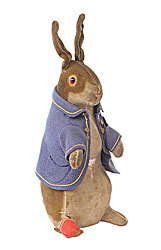 However, if you want something really special, then the R. John Wright company produced a limited edition Peter Rabbit, made from air-brushed mohair, complete with gold-buttoned blue jacket and handcrafted leather slippers, following him up with various other Beatrix Potter animals. Another range of toys, issued a few years ago by Vivid Imaginations, consisted of gift sets containing flock-covered Beatrix Potter figures. 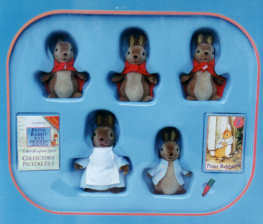 The sets included ‘Peter Rabbit and Friends’, the ‘Tale of Samuel Whiskers and the ‘Tale of Tom Kitten’, while many other creatures could be purchased individually. Averaging three inches tall, these little animals were surprisingly realistic and were carefully dressed. They came complete with a collector’s picture card file, and were packaged in a smart blue box with a lift-up lid. The Peter Rabbit set was particularly appealing, with Mrs Rabbit and Peter dressed in pale blue, and Flopsy, Mopsy and Cottontail, in scarlet The subtle shading of the flock fur looked really true-to-life. There have been hundreds of toys based on the Beatrix Potter characters, and it is impossible to list them all – board games have long been a favourite, and many of them feature tiny models of Peter and his friends as playing pieces. Older versions are already in great demand, not only amongst Beatrix Potter enthusiasts, but also by collectors of board games. Many of the newer kinds are just as attractive, and it might well be worth investing in one, because so often playing pieces, dice or instruction cards are lost when they are bought secondhand. Card games featuring the characters abound, as do jigsaw puzzles and various other pastimes. 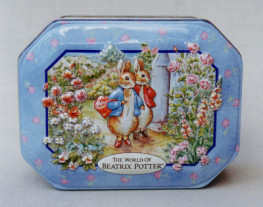 In the 1980s plastic tile puzzles were made; good additions to a Beatrix Potter collection. The prettiest toy is a gorgeous Barbie which was produced in the late 1990s. 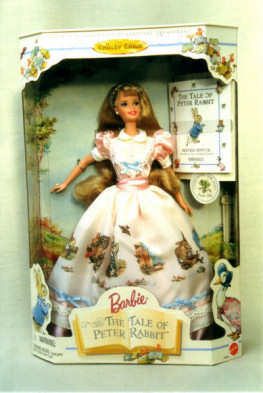 This Collector Edition, first in a collection of Keepsake Treasures, was called the Tale of Peter Rabbit, and depicted Barbie in a pretty dress with pink puffed sleeves and white lace bodice. Her skirt was printed with illustrations from the Peter Rabbit book, edged with lace and blue ribbons. The doll came with a small storybook, and she would form the centrepiece of any collection of Beatrix Potter playthings – although it’s doubtful whether many of these dolls were actually bought for children, let alone played with by them. These Barbie specials are invariably collected by adults. Another group of children’s products which adults often buy are the character-type bubble bath containers. Grosvenor have produced many over the years, amongst them charming models of Peter, Benjamin, Tom Kitten and Jemima Puddleduck. They have also issued boxed sets of toiletries – talc, bath cubes and bottles of bubble bath – decorated with the various characters. These are always worth saving, as so often, once the product is used, the packaging is destroyed. Other related ephemera include decorated boxes of tissues, kitchen paper rolls, calendars, Easter eggs, small tins and advent calendars – all of which tend to be soon discarded. Of course, if Beatrix Potter hadn’t written and illustrated her little books, we wouldn’t be collecting the memorabilia today. The very first book was printed privately in 1901, and the second in 1902, but then the company of Frederick Warne took over, producing the books in the famous, small, square format, chosen by Beatrix herself, so that they would fit snugly into the hands of children. Today, a first edition of a privately printed Peter Rabbit would cost you well over £50,000, and a first edition cloth-bound Warne copy £15,000. More books rapidly followed – in 1902 came the Tailor of Gloucester (again privately printed at first), then Squirrel Nutkin (1903), Benjamin Bunny (1904), Tale of Two Bad Mice (1904), Tale of Mrs Tiggy-Winkle (1904). The books came thick and fast during the early years of the nineteenth century. Prices vary considerably, depending on condition and edition. 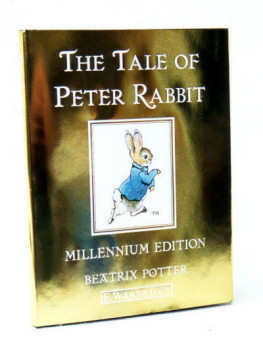 Coming up to date, after the great success of the Millennium Edition of The Tale of Peter Rabbit – issued in the traditional small, square format, but instead of the familiar white paper dust wrapper, the edition featured a stunning gold cover – the idea was extended. Now, special centenary editions of the books with gold wrappers are being issued each year, the 2006 editions being ‘The Tale Of Jeremy Fisher’, ‘The Tale Of Miss Moppet’ and ‘The Tale Of A Fierce Bad Rabbit.’ These beautiful little books are not only ideal gifts for a special toddler, they make delightful treats for adults. The somewhat formidable Miss Potter could surely have never imagined that, more than a hundred years after she first wrote the story of that naughty rabbit, we would still be reading the books, collecting the toys, playing the games and bathing in the bubbles!